The current EWB RTP project is the development of a sustainable water supply for a population of 75 families (approx. 320 personnel) in Calante. This is the most prevalent issue with the village since the current water storage facilities are primitive and undependable and contribute to gastrointestinal diseases. Satisfactory completion of a sustainable potable water supply and storage infrastructure will facilitate a significant increase in the health and quality of life for the local population. The village of Calante is part of the municipality of Uspantán, Guatemala. The area has a history of internal armed conflict, stifling economic improvement and development and thus leaving families in extreme poverty. Most family’s diets consist of corn and beans. Household incomes average 50 Quetzals ($6.50) per day for family subsistence. Average family size is 5 individuals. Calante has various needs including, access to potable water by gravity, home storage tanks to store rainwater, improved sanitation, better housing (through the construction of floors and ceiling changes). 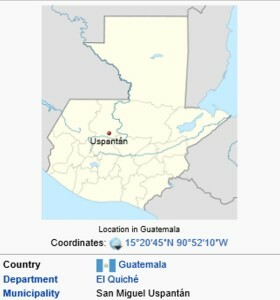 The Municipality of Uspantán is the local partnering organization and spearheads holistic development in the region. They maintain a staff of technical, operational and administrative personnel to support the project. They are well-structured, engaged and supportive in the local development activities.